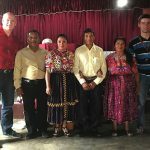 The ministry headquarters is in Coatepeque, in the northwestern area of Guatemala. 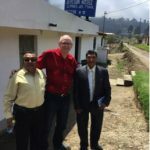 Our contact there is Roberto Hernandez Ventura, a pastor who has planted 15 churches within a 50-mile radius, and raised up and trained new pastors to lead each of those churches. I, Gordon, recently had the privilege of spending over a week with this wonderful group of dedicated pastors, encouraging them, and praying with them. It was a mutually beneficial time for all of us. I was so pleased at how the Lord worked during our time together to strengthen our relationships. In 2014, we launched our new Children’s Ministry with 14 children. 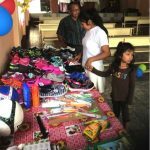 Presently we are ministering to around 20 children. 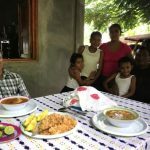 They come to the church on Saturday and Sunday and receive a nourishing meal that day, Bible training, medical care and are learning English. They also receive enough food to take home with them to last the next week. 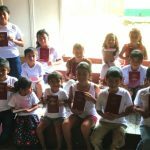 We were privileged to take over 100 Spanish/English Bibles to give to the children and pastors on our trip. These children come from situations that are less than ideal. Some have one parent at home, many have none and are cared for by extended family or legal guardians. Several have been either neglected or abused. 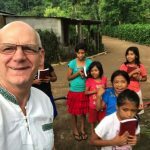 Our goal was to provide a safe place for them, food and medical care, and most of all, a loving, caring environment where they can learn about the love of Jesus. 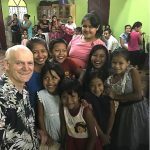 It was our privilege to meet each of these children and workers and bless them with a new set of clothing, including shoes, and some quilts and treats from our church in Canada.